Fetal alcohol syndrome (FAS) is a term assigned to a group of congenital defects of the children, arising from the drinking habit of their mothers during pregnancy. Drinking is strictly prohibited during pregnancy as this habit exposes the developing fetus to a multitude of physical and mental deformities. Drinking during the first and second trimester of pregnancy seriously affects the organ and brain development of the fetus. The worst fact is that most of these deformities are incurable and manifest in severe forms as the child grows into an adult. Fetal alcohol syndrome can be easily avoided by staying from drinking during pregnancy. The chances of FAS cannot be over ruled even if women consume alcohol in limited quantity during pregnancy. The signs of Fetal Alcohol Syndrome vary with every child and can be identified in the newborns as well. You can identify FAS in a child by the following signs. Babies exposed to alcohol in the prenatal stage have very low birth weight. Women tend to metabolize alcohol faster than men, which reaches the fetus through the placenta. Drinking during the first trimester of pregnancy seriously impairs the normal embryonic development of the fetus affecting its overall growth. As a result, the birth weight of the newborn is significantly low. Babies with FAS lag in overall growth and development that persists throughout the growing phase. Newborns suffering from Fetal Alcohol Syndrome often show weak response to suckling. They face problems in latching with the mother’s breast. Alcohol consumption during pregnancy affects brain development of the fetus, and the baby is born with poor motor skills. Newborns also suffer from the alcohol withdrawal symptoms which are reflected through their irritable mood and sleeping disturbances. Newborns suffering from this disorder express their irritation through crying and hyperactivity. They lack jolliness as they grow older. 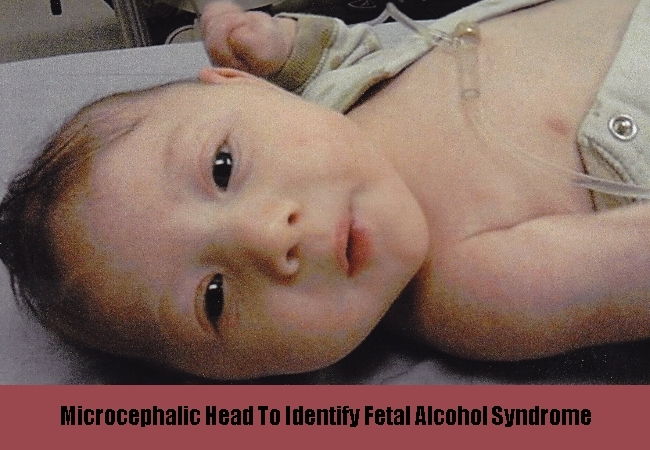 Fetal Alcohol Syndrome can be characterized by small circumference of the head (microcephalic head) and small eyes. Protruding foreheads and cleft palates are also observed along with this deformity. The small size of the head may not be apparent in the initial stages unless compared with that of other children of the same age group. Pediatricians can detect this condition by measuring the circumference of the head of the baby. FAS can be identified by the poor learning abilities of the children due to their retarded mental and physical growth. Babies take unusually longer time to sit, crawl and walk. The learning difficulties are manifested as they grow up. Pay attention to these signs at an early age and seek professional consultation as soon as possible. Early detection of these abnormalities can help in the mental and physical development of children suffering from FAS. Children suffering from FAS often exhibit lots of behavioral problems. They are usually hyperactive and talkative in nature. They get irritated easily and show impulsive attitude. Their hyperactive nature makes them inattentive. They lack the ability to concentrate and become poor learners. Though they are talkative in nature, they lack proper social judgment. Children with FAS need special training to develop their cognitive skills and make them socially habitable. Exposure to alcohol in the prenatal stage results in poor brain development of the fetus. Consequently, children exhibit very low IQ in the range of 60-70 during their learning stage. This is not considered as a serious deficiency in US as statistics have proved that children with moderate IQ can be educated to an appreciable level. Institutions with specialized training facilities can aid in improving the IQ’s of children suffering from FAS.